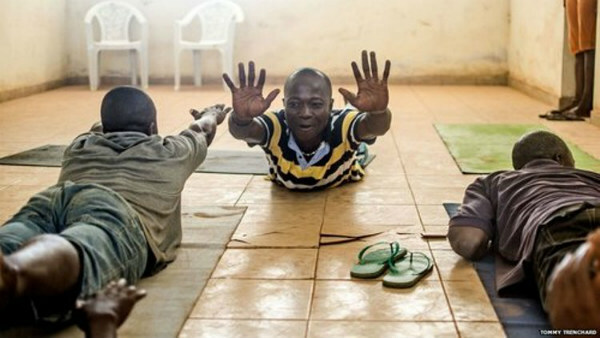 In a country known for its violent civil war, Tamba Fayia is teaching people how to do yoga. Fayia, also known as T-Man, is a former child soldier who became the country’s first qualified yoga teacher two years ago, and has since founded Yoga Strength, a group that wants to heal Sierra Leone through yoga. Fayia describes the people in Sierra Leone as being full of trauma and pain after the war, which lasted 11 years and claimed an estimated 50,000 lives. Even though the war ended in 2002, its effects still resonate throughout the country. In this nation of approximately 5.7 million people, the World Health Organization estimates that 715,000 suffer from mental disorders. According to Sierra Leone’s Ministry of Health and Sanitation, there is only one psychiatric hospital in the entire country. It’s staffed by only one psychiatrist, who is “retired from active government service,” and two psychiatric nurses. As sobering as these statistics are, T-Man has hope for Sierra Leone. He believes Yoga Strength can bring positive change to the local community and, eventually, the country. He wants everyone to have access to yoga—even people in hospitals, detention centers, and prisons. In fact, he currently teaches at the psychiatric hospital, where therapists tell the BBC that his classes have led to “clear psychological improvements” in some patients. A few years ago, T-Man also participated in the Africa Yoga Project, a Kenya-based organization that provides yoga classes, meditation, and community activism, as well as teacher training. He is eager to spread the yoga lifestyle, and Yoga Strength is expanding. Until recently, Yoga Strength’s facilities, located in a small shell of a room inside the national football stadium in Freetown, were run-down and full of broken appliances. The studio needed to be painted, there was no air conditioning, the toilets were broken, and the group had no yoga equipment. However, a 2013 fundraiser garnered over $3,000 for studio renovations. You can learn more about Yoga Strength through their website.